These days, pacemakers and defibrillators are often interrogated via a home-monitoring system that uploads information contained in the implanted cardiac devices automatically to a central server so it can be accessed by physicians remotely. This feature was added to most defibrillators after the rash of recalls struck the industry in 2005-6. 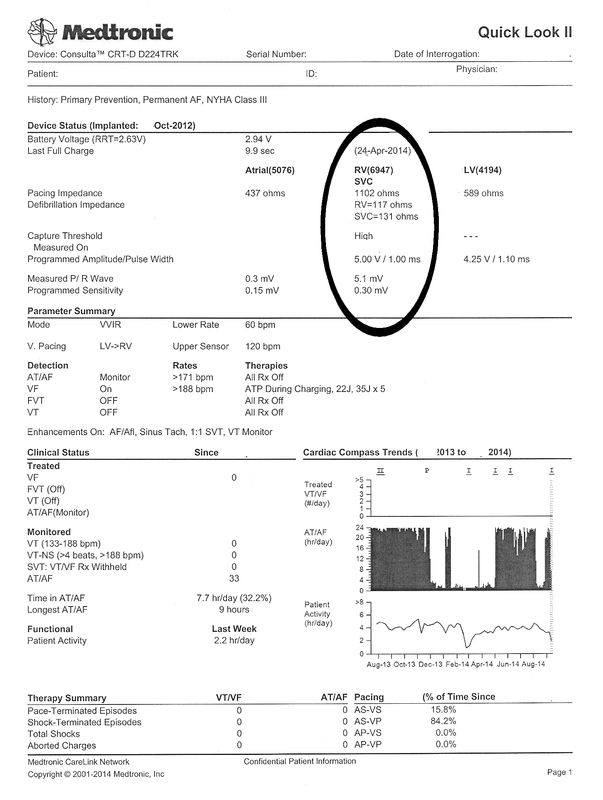 Not only can the information be uploaded electively by the patient, it can also be automatically uploaded if a nightly self-check detects a parameter out of range. 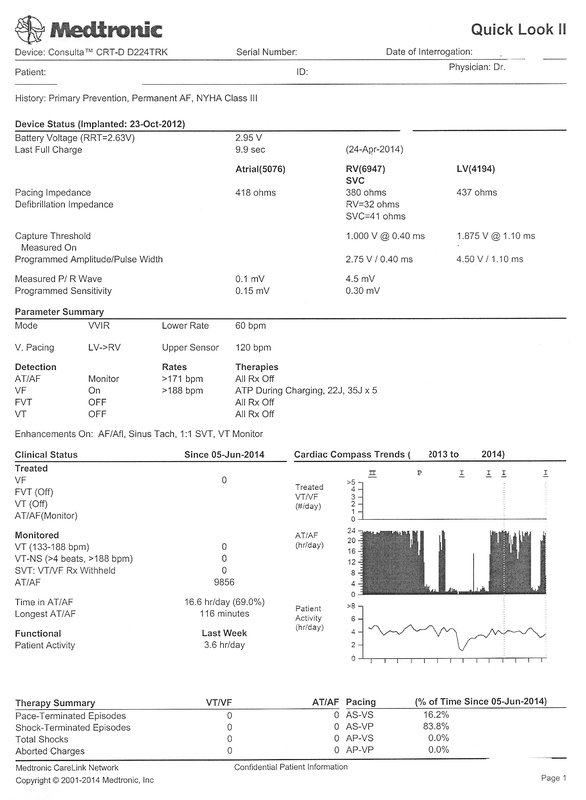 In this case, the patient was being monitored by Medtronic's Carelink remote monitoring system. "What did the last interrogation look like?" I asked. "Here's the old one was sent just three days before and looked fine," she said. "It's so weird. We've not had a problem with this patient's device since it was implanted in 2012." "Strange. I'm not sure what to make of this. Give him a call - we might have to change that RV lead," I said. "Okay," she said, then returned to the device clinic and I went back to seeing patients. Some time later, my nurse returned. "Um, Dr. Fisher, could I speak with you a moment?" she asked. "I got some more information. 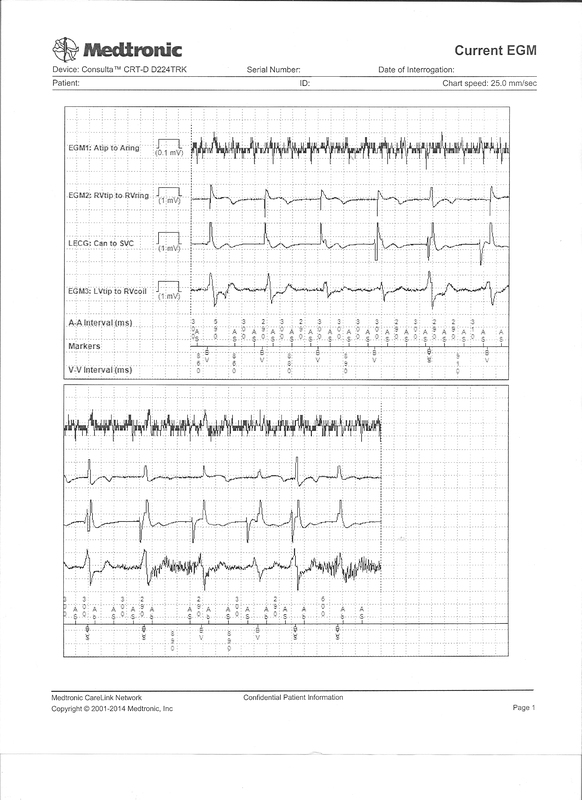 I think you better look at this" and she handed me his most recently transmitted real-time intracardiac electrogram recording that was sent with the latest transmission. 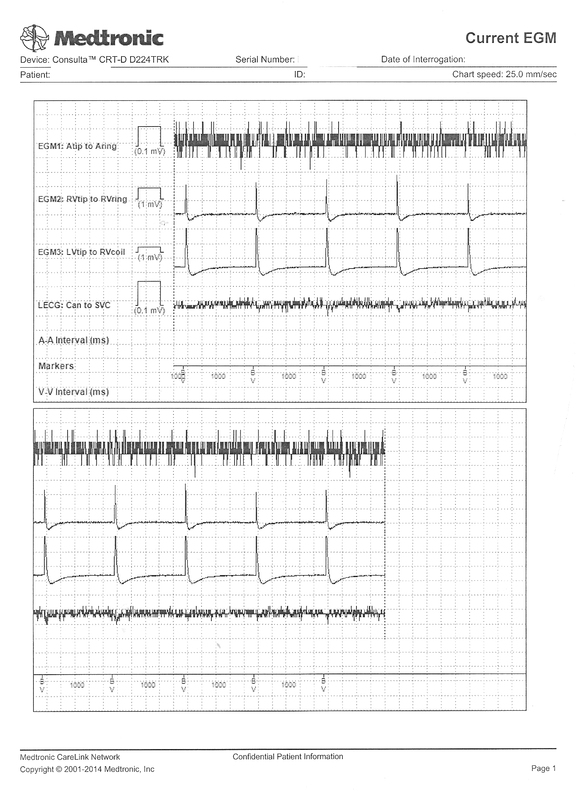 What did it show and why were the RV lead parameters abnormal? After you've written on a blog for a long time, you begin to ask yourself why. Oh sure, there are the great opportunities for a single person to make a point, to act as a tiny tugboat trying to push a corporate mothership in a slightly different direction, but you begin to realize that there are very few times that actually happens. You try to provide a voice to issues that are often unheard, then realize that voice is only occasionally appreciated but more often duly noted, then ignored. This is the nature of internet and quite frankly, medicine now - it is a world of competing interests. On one side you have the patients, doing a messy job of getting sick, and corporate health care systems - either government, private, for-profit or non-profit - doing their very best to make sure their illness is neat and tidy, easy to control, perfectly understood, and quantifiable. To this end, each has their own agendas that must be served, be it another regulation, value-added improvement, or a profit motive to secure the bottom line. This idea came to me yesterday in clinic. Increasingly, every microsecond of my day, my week, my weekend has now been efficiently parsed into tiny computerized scheduling chunks. It doesn't matter where I work, because like The Cloud, location doesn't matter - schedulers and administrative handlers can reach me, be it by beeper, computer, Outlook email, EPIC email, desk phone or my personal iPhone. There are so many places to check for messages that when I don't respond, the person trying to reach me just moves up the chain of communication options. Eventually there's no down time, no time to think, there are few places to go where there is quiet any longer. It's become life by a thousand interruptions - a Big Flail. Increasingly, there's a push to do away with beepers and move telecommunications in medicine to my personal iPhone. But I an resisting this because I need to set a boundary between work and my personal life - if for nothing else but self preservation. We are told this is being done in the name of "security" and "non-secure beeper messages" but I think it's because people don't want to wait. They need their answer now. I really wonder what the evidenced based data on beeper message hacking is in health care and if more patients were helped or hurt by beeper data breeches. There's a better idea, they say: consolidate. It's more "efficient." I know, I'm such a Luddite. But to whom do I respond when that head administrator calls on my iPhone as I'm examining a patient? How to I separate a Twitter message from an ER message? Does the act of looking at my phone when I'm with a patient engender trust or an appearance of distraction? It's hard to argue with "security" when someone creates a new medical policy. We all want to be secure. We all want to know that our most private and personal medical information is protected from prying eyes. But quite frankly (and this is very politically incorrect to say) real information security in medicine is a joke. After all, people's lives are perfectly encoded on a computer now and eight different billers, coders, insurance company trolls or hospital marketers can delve into that database of information and find specifics about a patient or group of patients with simply the click of a button. Phishing schemes make a mockery of our passwords. Seriously, who are we fooling? Let's be honest: paper charts housed in a known location behind a locked door were MUCH more secure. Hurry up. Click here, click there, "Excuse me," "Can I have a moment of your time? ", "There's a the 7 am meeting tomorrow," "What was that Ms. Jones? ", "Yes, I'll try to make it," "Did you try it unipolar? ", "Yes, I'll check my inbasket,""You left your addendum open,""They're calling for the cardioversion,""Should we add him in? ", "I have to take my board review course, can you take call?,"The ER's calling,""Can you check her pacer, too, when you see her? ", "Did you sign the EKG?" Doctors need some quiet, down time, some time to think, to pay attention. We need to create our own boundaries between our personal and professional lives that are respected. We need to think we can get away, to regroup, have some quiet time for ourselves or with a patient, even for a moment. And if that means that some of us want to separate work from home by the use of a beeper instead of an iPhone, so be it. Otherwise, our personal lives will become a Big Flail, too. Installing a permanent pacemaker or defibrillator has become commonplace event in cardiology these days. These devices implanted in a patient are comprised of two main parts: the lead(s) and the pulse generator. After installing the leads in the heart and connecting them to the pulse generator, the lead and pulse generator assembly are then placed beneath the skin in a small subcutaneous (or in rarer cases, submuscular) "pocket" that is created surgically. Considerable care is taken to cauterize bleeding vessels when the pocket is created. 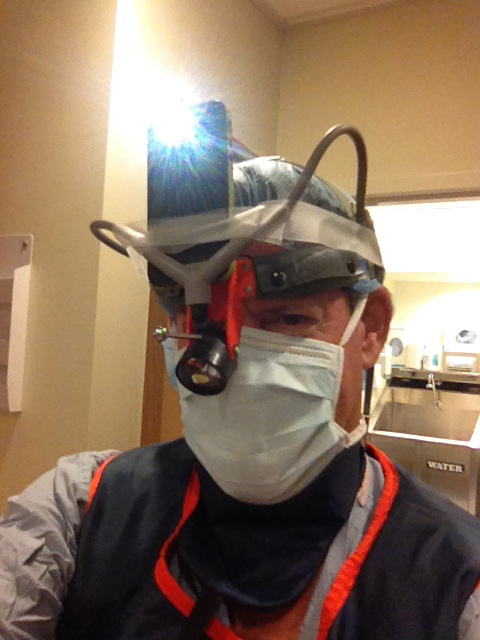 To facilitate visualization of these occasional bleeding vessels deep within the created pocket, I prefer to use a surgical headlamp to direct the light deep within the pocket cavity rather than relying on a conventional overhead surgical light. I have found that headlamps have helped me limit my incidence of post-operative pocket hematoma development. So as things have had it, I seem to have a knack for attracting every eighty- or ninety-plus year old who needs an emergency pacemaker on the weekend when I'm on call, and this past weekend was no exception. So the team was assembled and the pacemaker implantation equipment readied. They knew I liked a headlamp, so they dug deep into the recesses of their inventory to pull out their only headlamp that appeared to be from a bygone surgical era. Being pressed for time, I couldn't argue and had to make due, but knew that this headlamp might not be very reliable, especially as I saw how the headlamp's fiberoptic cord was secured to the light source that generated about as much light as a few well-lit candles by a cumbersome spring-loaded Rube Goldberg contraption. As I placed the headlamp on my head, and tightened the plastic strap that housed the headlamp to my head, I needed a backup plan in case the light failed. Would I have to use the overhead light and make do, or might there be another way? I needed another MacGyver Moment. 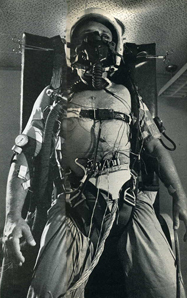 Cybernetics, the scientific study of control and communication in the animal and the machine, used to be the stuff of science fiction. Today, thanks to a Faustian bargain between corporations, regulators, and politicians, it is defining medicine. Every day, the exponential explosion of data entry and regulatory requirements doctors endure boggles the mind, all in the name of "health care." Feedback is critical to field of cybernetics. And when Medicare's straps have you by the balls, you comply. No longer is it good enough to learn a diagnosis or procedure code, doctors must attend online courses to learn how to use a new "calculator" to determine a more proper code. After all, there will soon be over 70,000 of them. Each more specific than the other, each more ridiculous. There are five data-entry fields to click on that calculator, each another tiny, yet time-consuming decision to be made, just to determine a code. No doubt teams of clever twenty-something computer programmers are overjoyed with their coding calculator and the way it pops up automatically on our screen when needed, then disappears. So pretty. So cool. See how easy they've made it to complete that regulatory requirement? And this does not begin to address the increasingly algorithmically-driven electronic medical record and procedures envisioned in the years ahead. As if all things can and must be perfectly defined and quantified in medicine. No mistakes. No judgment needed. No need to type. Just close your eyes, click a few buttons, and follow the pathway. Stop thinking. Just do it. Enter the data. Resistance is futile. ... and perfect physician cyborgs.